We trust our Bangkok map will help you navigate the biggest city in south-east Asia easier. Within this mix of modern and historic, chaos and order lives approximately 12 million Thais and it is the gateway for most who visit here before setting off to other hot spots like Phuket, Koh Samui and Pattaya. The city is cut in half by the majestic Chao Phraya River on its banks luxury 5 star hotels in Bangkok offer stunning views from private balconies. 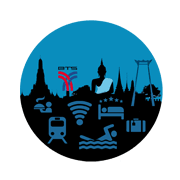 Also along the river which can be explored by tourist boat attractions like the grand palace, temples, including Wat Arun (Temple of the dawn) and traders along the canals branching off the main flow can be experienced. The city is divided into different districts which include popular tourist locations such as Sukhumvit, Silom, Siam, Prathunam, Riverside, Chidlom and Ploenchit. No matter which area your hotel is located in, transportation in the city is well organized, effective, plentiful and relatively cheap to get you destination in minimum time. These include taxis, tuk tuks, scooter taxis, the sky train and MRT underground.